A-frame is basically lacking parallel shins throughout most of the turn. The issue is really that the skis are not at the same angle - the inside ski is generally almost flat on the snow. There are bad a-frames and a-frames we can ignore - A-frames are always a symptom and not a cause and they are usually a problem when accompanied by other symptoms like diverging skis, hip dump etc. There are many things that can cause an A-frame, depending on one's developmental level and, as usual when evaluating performance, we'll use the EEPPTT framework. Equipment wise, boots out of alignment is a root cause of many A-frames. Some grow out of it, some get used to compensating. Boots that are too large are also a problem, as the feet and ankles have no effect and the skier tends to use the hips to drag the skis on edge. Recreational skiers tend to choose "comfortable" boots, which are too large for fine control. Speed can be an issue. Usually when the speed is too high or environment too gnarly, technical finesse goes out the window and all kinds of bad tendencies come out. Take the challenging terrain out of the picture before attempting to remedy this. 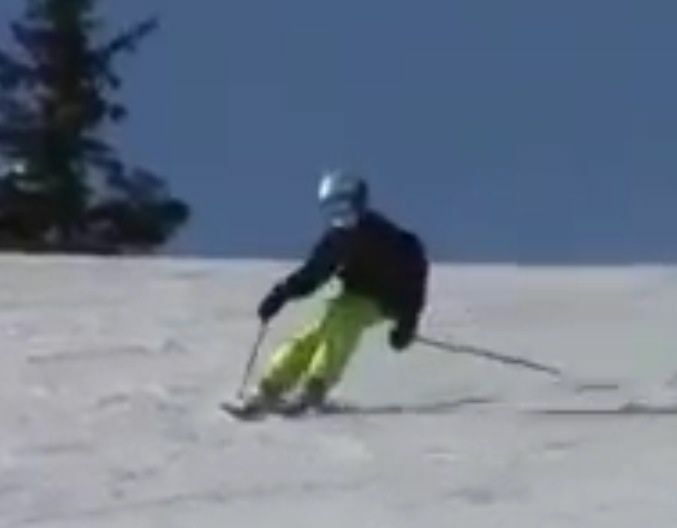 Note that there are release sequences that give the appearance of A-frame, especially when coming from a wider stance - visible usually in WC speed skiing. Related: Hip dump is related to A-frame and, to fix it, after looking at the boots, use the same Lower body workout progression. Viewed 2232 times ( | Print ) this page.